There are currently no women in solo positions in the CSO, except for harp. How many women have occupied solo positions in the CSO since Helen Kostas Hirsch was bumped from her position after Philip Farkas returned to the orchestra in 1947. The Chicago Tribune in 2000 reported that there had been none since. Any since 2000? I would also like to know more about why she left in 1948 after being demoted to third horn. Did she feel she was treated unfairly? She continued to perform in the Grant Park Symphony and Lyric Opera. Why wouldn’t she have stayed in the CSO? In 1979 my wife won the trombone audition for the Maggio Musicale in Florence. Ricardo Muti vetoed the results with the declaration that there were already too many women in the orchestra. The position was thus given to the man who came in second, Jeff Haigh. Historical events like these shed some light on why so few women have occupied solo positions in major orchestras. As an interesting aside, the CSO did not have a women’s dressing room in 1941, so Helen Kostas Hirsch had to change into her concert attire in a broom closet. When my wife’s orchestra, the Munich Philharmonic, moved into its new building in 1984, the Gasteig Kulturzentrum, it was discovered that no dressing rooms for women had been planned. The few women in the orchestra took over one of the dressing rooms reserved for soloists. As the number of women in the orchestra increased, the room became so crowded the women rebelled and summarily took over an additional room. Just one more aspect of the challenges women faced as they entered orchestras. 1) Not good if the story about Muti is true. 2) Chicago is still auditioning for principal horn (for more than 2 years now, no? ), I can see why they’d want to take the time to find that perfect person. But if Dale Clevenger hadn’t hung on to his post well beyond his prime by 10 years to the point even the music critic at the New Yorker called him out on his flubs, the orchestra could have been found a principal a long time ago. 3) Just as an aside, your wife’s horn story and Muti, sort of like the reverse Sabine Meyer story, where Karajan wanted the clarinetist, but the orchestra vetoed her (apparently after 3 successful auditions). To this day, I listen to Sabine Meyer and can’t figure out why the Berliners thought her sound did not fit in, she has the most Germanic sound of all clarinetists out there today, even more so than the current principals, Fuchs and Ottensamer. Abbado chose her to be principal in his Lucerne Festival Orchestra, so basically 2 Berlin music directors preferred Meyer. A friend and former director of the BPO told me that it wasn’t about Meyer’s playing or gender, but about Karajan’s forcing her into the orchestra. The BPO’s musicians choose players (and conductor), not the other way around. It’s true that Karajan tried to push her into the orchestra, but at the time, the Berlin Phil did not have any women members, and the idea of her their inclusion was strongly resisted. Hence Karajan’s efforts to work outside the normal hiring procedures. During this fracas, the BP hired the first woman in the orchestra, violinist Madeleine Carruzzo, in 1982. The two events were probably related. The Vienna Phil had a lot of support in Austria even as protests against it arose, but the Berlin Phil found no such sympathy in Germany when the Sabine Meyer scandal appeared. The Berlin Phil was quickly forced to admit women, though it still has the third lowest ratio in the world. Kotas! It’s Helen Kotas, William! She is a very important figure historically among women orch. players. She predates Doriot, who often gets kudos for being the 1st US female principal. Interesting also that no one’s explained the reason behind Ms. Kotas’ appointment at that particular point in time. There were also several other landmark female orch. appointments during that time period. I believe there was another female principal brass appointment. The reason? World War II. 1939-1945. Men were being drafted, enlisting and women in every profession were “taking over” for the men who were called away to serve in the military. This included orchestras. I don’t know Mr. Farkas’ story, but he probably was called into the military if he left the orch. in 1941. WW2 was in full swing. And of course he would have wanted to come back when the war was over which explains his return to the orch. in 1947. Helen Kotas was not the only woman called upon to replace a man in a US orch. during the war. There were several others. And if orch. salaries followed the pattern of the many women in other professions doing men’s work, they were probably paid lesser salaries. William, I thought I read this all on your site! Didn’t you write about this? Thanks for the correction. No, I haven’t written about her, but I have about 300 pages of material on my site and I often forget things I have on there. I believe The Horn Call and the IWBC have info about her on their sites. Farkas didn’t play in a military band during WWII. He began his career in the Kansas City Philharmonic in 1933 before he finished high school. In 1936, he became first horn in the CSO until 1941. Then he moved to the Cleveland Orchestra (1941-1945), the Boston Symphony Orchestra (1945-1946), back to Cleveland (1946-1947), and finally back to Chicago (1948-1960). I could understand if Helen Kotas felt mistreated by being pushed aside to make room for him. It wasn’t like he was just gone for a short time while trying another orchestra. With union protections, the nature of her demotion would be unlikely to happen today. The GMD of the CSO, Désiré Defauw, left in 1947 and was replaced by Artur Rodziński. The latter was known for dismissing musicians and his inability to work with orchestra boards. He left the CSO after one year. It would be useful if someone would write an article about what actually happened. People like Arnold Jacobs (the orchestra’s tubist) and Ed Kleinhammer (bass trombone) spoke with high praise about Helen for decades after she left. Interesting. I agree, someone should write about it! Regarding Mr. Farkas, perhaps he didn’t actually serve in the military but the logical question is why did he move to Cleveland and Boston precisely during those WW2 years? It’s very possible HE was replacing another man serving in the war, opening up his own spot for Helen Kotas in Chicago. I really don’t think these are random appointments and movements of orch. personnel. The US was at war and it affected the work force, the available pool of male workers, tremendously. And as a sidenote, orch. musicians who served in the military did not necessarily just play in bands during wartime. Many were stationed overseas, some on the front lines. orch. player who was assigned to a band. That would have been a pretty cushy gig during WW2! They were soldiers, and there are tales of great orch. players who put down their instruments completely to fight and then got grief from conductors when they returned to their orchs. and were out of shape. The 1st example that comes to mind is John DeLancie. He was a soldier in WW2. He was stationed in Germany and we can be thankful for that because that’s when he decided to show up at Richard Strauss’ home to tell him he should write an oboe concerto! That’s an interesting idea about why Farkas was able to job hop so much. I was just reading about the iconic jazz pianist Dave Brubeck whose army band was caught behind enemy lines during the Battle of the Bulge. Those horrific experiences led him to write large, anti-war classical style works involving religious music, civil rights, and peace. He felt he could best express his outrage about war and the hypocrisy it creates through his music. It must have been a special experience for him to reopen the opera house in Nuremberg with his army jazz band. Cynthia Yeh, the principal percussionist of the CSO, is a woman. Very interesting. Does this mean she is the only non-harpist woman in a principle position since 1947, and only the second one in the history of the orchestra? So again, are there any other women who have been principals in the orchestra? Interesting that she plays percussion. In a survey of 35 major US and European orchestras by Regina Himmelbauer in 2005, only 2.55% of the percussionists were women. I also notice that 14 of the violinists in the CSO are Asian and 4 of the violists. An interesting contrast to the VPO which has never had a fully Asian member with an Asian family name in its history, even though about a quarter to a third of the student body of its feeder school, Vienna’s University of Music, has been Asian for the last 50 years. The VPO says there’s never been an Asian good enough. The VPO didn’t give an Asian tuba player tenure. He’s now the Cleveland Orch’s principal tubist. The archivists and historians will have to clarify this for us please. No, Helen Kotas came before Doriot. Doriot’s was a more publicized appointment, so she’s often mistakenly thought to be the 1st woman principal. Jennifer Montone is doing great work as principal at the Philadelphia Orchestra. 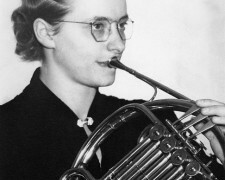 And her teacher Julie Landsman was the Met Orch’s principal horn for many years. Four of the nine hornists in the Met are women. I’m not certain, but I think women were in the majority (5 to 4?) before Julie retired. I haven’t checked the numbers in quite a while, but I think there are more women hornists in top US orchestras than women clarinetists. In the 2005 survey I mention above by Regina Himmelbauer of top US and American orchestras the ratio was 10% for women hornists, and 8% for women clarinetists. The ratios for just US orchestras are higher, but there were still more women hornists than clarinetists. As it happens, the CSO’s neighbor to the north, the Milwaukee Symphony, has three fantastic female principals, who are non-string players. They are Katherine Young Steele, oboe, Sonora Slocum, flute (who has performed as guest principal of the CSO, according to her biography), and, something that always gives me pride, Megumi Kanda, trombone, who is a Japanese woman. To add to that, Sonora Slocum is black; her and Megumi are two of the only minority women in the country who do not play a string instrument. It’s a while since I read it, but Nancy Jordan Fako’s excellent biography of Philip Farkas covers his whole career in detail. As I recall, he did not serve in the army and WW2 was not a factor in his return to CSO. He simply felt like a move back to Chicago, and the conductor colluded in bringing him back and demoting Helen Kotas. If you read between the lines, her departure a year or so later was the result. Could it happen these days? Let’s hope not! I doubt very highly that it could happen today, but it certainly did happen back then. I know of another example from just a few years later, of a principal player (a man) in the CSO who was forced out and replaced by another player (also a man), for political and other reasons not related to job performance. I am sick of these ridiculous stories, each one more inaccurate than the last, and all of which are an insult to harpists. As if harpists are not musicians. Well, many are not, but that’s another issue. THE FIRST WOMAN TO HAVE A PRINCIPAL POSITION IN AN AMERICAN ORCHESTRA (who cares anyway) WAS FLORENCE WIGHTMAN, who served as Principal Harp in the Cleveland Orchestra, but she chose to leave and play at the Roxy Theater in New York instead, and she was replaced by Alice Chalifoux, who stayed. THE FIRST WOMAN TO REMAIN IN A PRINCIPAL POSITION was Edna Phillips, in the Philadelphia Orchestra! Those are the facts. After that, there is Elsa Hilger, a section cellist in the Philadelphia Orchestra.